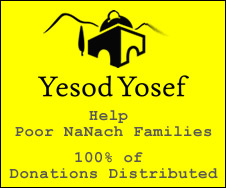 B"H this Nanach just produced 500 copies of a new Nanach disc, B"H all the songs are available for free on the nanach.net music site - complete music by Lazer Storch of Nekuda Tova (and two other songs), the catch is that many of these songs are in Yiddish, especially targeting the ultra haredim and yeshiva bochurim (single boys/ students) that don't have access to computers and internet B"H.
Amongst the many awesome songs is the incredible: Rabbainu ze (is) hu-abba (father) Rabbainu ze (is) hu-emma (mother) Rabbainu ze Na Nach Nachma Nachman MeUman (as taught by Rabbainu and repeated by Saba)! It is amazing to hear little pure Meah Shearim children gleefully singing this rocked up tune! This production was made possible with the help of your contributions, thank you all.